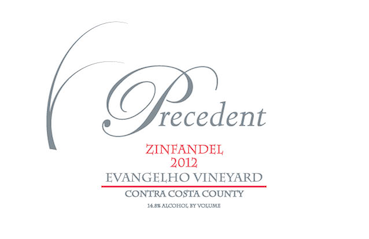 2012 Zinfandel, Evangelho Vineyard Contra Costa Co. 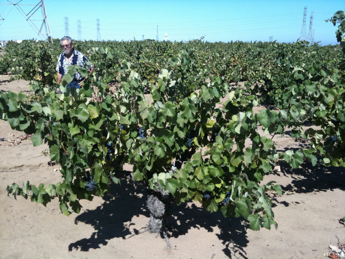 The Evangelho Vineyard is one of the great old vine Zinfandel vineyards in the world. Wines from vineyards like this are unique and cannot be replicated anywhere; they are truly California's greatest gift to the vinous world. Planted in 1890, on their own roots, in over 30 vertical feet of alluvial sand these vines somehow eek out an existence despite being farmed without irrigation. The vineyard produces fantastic and soulful wines. The vineyard is at the westernmost viticultural edge of California's great Delta. Warm days, cool nights and wind define the climate that shaped this spit of sand into a once thriving agricultural area. These sands are granite and quartz, literally blown from the Sierra Nevada over millenia. Urban growth has impacted the area and now few of the old vineyards are left. Agriculture still dots the landscape, between housing developments and shopping centers: a reminder of the area's past. Harvest occurred on August 20, our earliest harvest at Evangelho, at 23.9 Brix, 3.2 pH and 7.6 g/L . As always the picking decision here is a complex endeavour. Our section of Evangelho is inter-planted with smaller amounts of Carignane, Mataro (Mourvedre), Palomino, Muscat, Chasselas and other varieties as of yet un-identified. Each of these historic varieties have different ripening trajectories giving the finished wine great complexity. As always we harvest and co-ferment in the true "field-blend" tradition. The grapes were de-stemmed to tank where they soaked for nearly a week before the indigenous yeast took hold. Fermentation was vigorous giving great color, structure and soaring aromatics. We pressed the wine at cap-fall, allowing the wine to go nearly dry on the skins. Total maceration time for the wine was 16 days. Three weeks of resting in steel before the wine was placed in seasoned French Oak,; this helps to preserve the sense of place and strong vineyard character. Malolactic fermentation completed in the late winter and the wine was given its single racking in January. We bottled 123 cases of 750 mLs on July 29, 2014. Dark-red to near black in color. This is the most intensely aromatic wine we have produced from the vineyard. As always we aim for a style that is traditional with a firm vineyard voice. The vintage character of '13 is one of great intensity, but well balanced with bright acidity and vivid fruit. This is the lowest alcohol, 13.9%, we have ever had from this site. The vineyard speaks loudly rather than the hand of the winemaker -- something we firmly believe in.